...scraps, crochets, paints, sews, photographs, cooks, decorates, and blogs! 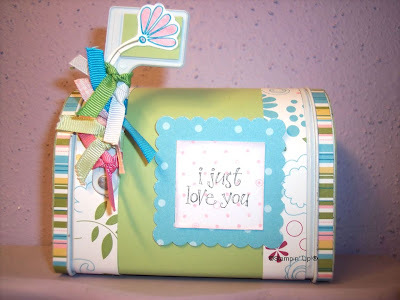 I first saw these adorable mailboxes over at Expresso Yourself. My darling friend, Kate, told me that Target often has them in their Dollar Spot. But, alas, my local store NEVER EVER has had them. My friend, Amy, and I have been teaching a sewing class for the elementary-aged kids at church over the past three weeks. This week they will finish making their very own pillowcases and also have the opportunity to make a second case to donate to the Conkerr Cancer Pillowcase Program at a local hospital. I made a pillowcase today to donate to a student of mine who is in the hospital with cancer. It was really easy to make using the "roll-up" method. Here's how it's done. ...when you still can't find one after searching all the local stores, recoiling at prices online, and having no desire to experiment with paper mache. Step 1, settle for a non-Thomas pull-string pinata in the right color scheme. Hi, Spidey! You are too scary and will soon be banished. (Bradley is scared of "the spidermans!") Only $8 at a party supply store. Step 2, cover image with Stampin' Up! card stock in the very-nearly-Thomas-blue In Color, Pacific Point. Tape edges. The kids aren't going to notice it...they are three for goodness sakes! Step 3, make an old school compass thing. You know how the cute carpenters on DIY network always do it! Grab a string, ruler, and pen - make your circle to cover the scary scary Spiderman. 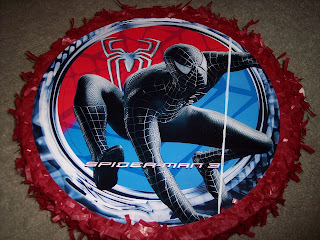 Cut it out and glue to front of pinata with hot glue. Step 4, scan the front of your Thomas scrapbook. If your child is as obsessed as mine I know you have one. ...Wife of Mike, Mom of Chloe and Bradley, Friend of many, Teacher of exceptional children, Student of much, and Child of my risen Savior, Jesus Christ. SU! on the Today Show!